Although the antibacterial effects of Abs are well studied in in vitro systems, the in vivo effects of Abs cannot always be accurately predicted. Complicated cross-talk between different effector functions of Abs and various arms of the immune system can affect their activities in vivo. Using the mouse respiratory pathogen Bordetella bronchiseptica, we examined the mechanisms of Ab-mediated clearance of bacteria from the respiratory tract. Interestingly, although TLR4 was not necessary for protective immunity following infection, it was required for rapid bacterial clearance in mice that were vaccinated or adoptively transferred Abs. TLR4 was important for the rapid recruitment of neutrophils that are necessary for Ab-mediated bacterial clearance via a mechanism that requires both FcγR and CR3. These data are consistent with a model in which TLR4-mediated inflammatory responses aid in the recruitment of neutrophils, which phagocytose Ab- and complement-opsonized bacteria via FcγRs and CR3. Although pattern recognition receptors are known to be involved in innate immunity and the generation of adaptive immunity, their contributions to specific adaptive immune functions should be considered in ongoing efforts to improve vaccine-induced protective immunity. Antibodies are believed to play a critical role in resolving respiratory tract infections. In fact many parenterally delivered vaccines are tested for their ability to induce high serum Ab titers (1), and passive immunization with serum Abs has been proposed as a solution to problems as diverse as the rise of antibiotic resistance and bioterrorist attack (2). Although Abs have multiple antibacterial activities in vitro that have been characterized at the molecular level, the mechanisms of Ab-mediated bacterial clearance in vivo are not as well characterized. In classic in vitro experiments, effector functions of Abs include neutralization, opsonization, and/or complement activation (1). But successful respiratory pathogens have evolved mechanisms to avoid the effects of each of these. Activation of complement and lysis of bacteria is thought to be an important effector function of Abs to pathogens like Streptococcus pneumoniae and Bordetella pertussis (3, 4). Yet, in vivo studies indicate that S. pneumoniae possess surface structures that bind the complement regulatory component factor H promoting degradation of C3b deposited on the bacterial surface, preventing release of the chemoattractants C5a and C3a as well as formation of the membrane attack complex (MAC)3 (5). Although B. pertussis is rapidly killed by serum complement in vitro, this bacterium acquires resistance to complement in vivo by some unknown mechanism (6). In vitro studies indicate that mAbs of IgG3 isotype raised against capsular Ags are effective in killing S. pneumoniae (4). However, in vivo studies suggest a limited role for IgG3 following vaccination against this pathogen (7). Neutralization of adhesins and toxins can prevent a pathogen from attacking or invading a mucosal surface, and opsonization facilitates phagocytosis of pathogens. Bacteria such as Pseudomonas aeruginosa and Haemophilus influenzae secrete proteolytic enzymes that degrade Igs to prevent neutralization and Fc-mediated opsonization and phagocytosis (8). Although Abs can be effective in clearing these respiratory pathogens, their mechanism may not be the ones determined in in vitro experiments. Determining the actual mechanism of Ab-mediated clearance during infection is dependent on a robust natural model of respiratory disease. Bordetella bronchiseptica is a Gram-negative bacterium that causes respiratory diseases in various nonhuman mammals including mice (9). Therefore, the mouse B. bronchiseptica model has been successfully used to examine the intricacies of respiratory immunity (3). Previously we have shown that Abs are necessary and sufficient to clear this bacterium from the respiratory tract (10). This model offers an excellent opportunity to delineate the underlying in vivo mechanism of Ab-mediated bacterial clearance in the respiratory tract. The respiratory system is comprised of complex tissues, which must remain relatively sterile despite exposure to heavy loads of pathogens. This condition is partly achieved by physical barriers, mechanical forces, and rigorous surveillance by the innate immune system (11). Recently discovered pattern recognition receptors (PRRs) play a major role in mounting an immediate immune response against specific pathogens (6). The best-studied PRR, TLR4, is known to recognize the LPS of Gram-negative bacteria and induce a potent proinflammatory response (12, 13, 14). In fact TLR4 is critical for controlling respiratory pathogens such as P. aeruginosa, H. influenzae, and B. bronchiseptica (14, 15, 16). Although, many studies have described the involvement of TLR4 in the generation of adaptive immunity (17), its role in the function of adaptive immune mechanisms has not been well characterized. In this study we describe a novel role for TLR4 in mediating the effector functions of Abs in vivo. Our evaluation of Ab functions required for bacterial clearance in the respiratory tract suggests that complement is required predominantly for opsonization, and that CR3 and FcγRs are required for phagocytosis. Furthermore, recruitment of neutrophils that express these receptors is a TLR4-dependent response and is critical for Ab-mediated clearance of bacteria. Together, these data suggest a model for Ab-mediated bacterial clearance in which the TLR4-dependent inflammatory response recruits neutrophils to the lungs where they phagocytose Ab- and iC3b-opsonized bacteria via FcγRs and CR3. The complex combination of multiple Ab effector functions and the TLR4-dependent response reveals very close cooperation of innate and adaptive immune functions in clearing a pathogen from the body. B. bronchiseptica RB50 (wild type) was obtained after a single passage from an isolate from the nose of a healthy rabbit (3). Bacteria were maintained on Bordet-Gengou agar (Difco) supplemented with 7.5% defribrinated sheep blood (REMEL or Hema Resources) and 20 μg/ml streptomycin. Bacteria were grown in Stainer-Scholte broth with 20 μg/ml streptomycin to midlog phase (OD of ∼0.3 at 600 nm) at 37°C on a roller drum. C57BL/6 mice were obtained from The Jackson Laboratory, and C3−/− mice, which were backcrossed extensively onto a C57BL/6 background, have been described elsewhere and were gifts from Dr. R. Wetsel (University of Texas, Houston, TX) (18). C5−/− mice (B10.D2-H2dH2-T18cHc0/nSnJ) and their parent strain (B10.D2-H2dH2-T18cHc1/nSnJ) were obtained from The Jackson Laboratory. FcγR−/− (lacking FcγRI, RII, and RIII), FcγRI−/− and FcγRIII−/− (lacking FcγRI and FcγRIII due to deletion of common γ chain) and FcγRII−/− (lacking FcγRII) mice in C57BL/6 background were obtained from Taconic Farms and are described elsewhere (19, 20, 21). CD11b−/− (CR3−/−) mice were purchased from The Jackson Laboratory and are described elsewhere (22). Wild-type TLR4 (TLR4s) mice (C3H/HeN) mice were obtained from Charles River Breeding Laboratories, and TLR4-deficient (TLR4d) mice (C3H/HeJ) were obtained from The Jackson Laboratory. The results in C3H/HeN and C3H/HeJ mice were verified in TLR4−/− mice that were obtained from The Jackson Laboratory. Bacterial inoculum was prepared by growing B. bronchiseptica to midlog phase at 37°C in Stainer-Scholte broth. OD600 of the culture was determined, and bacteria diluted in sterile PBS to a final concentration of 107 CFU/ml. An aliquot of this preparation was plated on Bordet-Gengou agar to verify the bacterial concentration. Mice were lightly sedated with isoflurane (IsoFlo; Abbott Laboratories) and 5 × 105 CFU (except where otherwise stated) of bacteria in 50 μl was placed onto the tip of the external nares. For the time course experiment, groups of four animals were sacrificed on days 0, 1, and 3 postinoculation. Colonization levels were determined by homogenizing the indicated organ in PBS and plating aliquots for colony counts. The nasal cavity and trachea were each homogenized in 500 μl of PBS and lungs in 1 ml PBS. The homogenates and necessary dilutions were plated in 50-μl volumes onto Bordet-Gengou agar with streptomycin. Colonies were counted after 2 days incubation at 37°C. For reinfection, animals were inoculated with 5 × 102 CFU in 5 μl of PBS by intranasal route. Twenty-eight days later, these mice were challenged with 5 × 105 CFU of B. bronchiseptica in 50 μl of PBS by intranasal route. On day 3 postchallenge mice were sacrificed and colonization levels determined as described earlier. For vaccination studies, animals were immunized i.p. twice at 2-wk intervals with 108 CFU of heat-killed B. bronchiseptica. Heat-killed bacteria were prepared by incubating bacteria at 80°C for 30 min. Two weeks after administration of the second vaccination, animals were challenged intranasally as described and sacrificed on day 3 postchallenge for determination of colonization levels as described. Intraperitoneal injection of 200 μl of convalescent-phase serum, obtained on day 28 postinoculation from mice that were inoculated with RB50, into naive mice was immediately followed by inoculation as described. Animals were sacrificed on the indicated day posttransfer and inoculation and colonization determined as described. Animals were handled in accordance with institutional guidelines. Statistical significance of data points was determined using Student’s unpaired t test. Ab titers of the sera used were determined as described by Kirimanjeswara et al. (10). Briefly, B. bronchiseptica was grown to midlog phase and heat-killed at 55°C for 30 min. This culture preparation was coated on to 96-well polysterene plates. Test serum was diluted and layered on this plate and probed with secondary HRP-conjugated anti-mouse Ab (specific to H+L, IgM, IgG1, IgG2a, IgG2b, IgG3, and IgA) (R&D Systems). Titers were calculated as the reciprocal of the dilution of the serum that was 0.1 OD405 higher than the naive serum control. Total leukocytes were isolated from the lungs after collagenase type I and DNase I digestion as described previously (23). Briefly, lungs were perfused with PBS and finely sheared with scissors. This lung homogenate was subjected to collagenase type I and DNase I treatment for ∼3 h. This method shears and releases only lung parenchyma but not the cartilaginous bronchus region. The enzymatically treated homogenate was layered over Histopaque 1119 (Sigma-Aldrich) and centrifuged for 30 min at 3000 rpm. The leukocyte portion was collected, and the total number of cells was determined by hemocytometer. Individual cell types were determined by staining the isolated cells with modified Giemsa stain by a certified clinical laboratory technician. One milligram of mAb RB6-8C5 (a gift from Dr. G. Huffnagle, University of Michigan, Ann Arbor, MI) was administered i.p. before bacterial inoculation. As a control, an equal volume of PBS was administered to mice before bacterial inoculation. Efficiency of neutrophil depletion was verified by counting polymorphonuclear cells (PMN) in blood smears collected 12 h after the treatment and was found to be almost 98% effective. PRR are known to play a significant role in innate immunity to pathogens (24). We have previously shown that one such receptor, TLR4, is critical for controlling the respiratory pathogen B. bronchiseptica (22). TLR4d mice inoculated with a standard dose (5 × 105 CFU in 50 μl of PBS given by intranasal route) of B. bronchiseptica succumbed to bordetellosis as early as day 3 postinoculation, whereas TLR4s mice survive and eventually clear bacteria from the lower respiratory tract (16). TLR4s mice harbored ∼1,000,000 CFU in the lungs and ∼10,000 CFU in the trachea, whereas TLR4d mice harbored 100- to 1000-fold more bacteria in the trachea and lungs on day 3 postinoculation (Fig. 1⇓A). TLR4d mice succumb to as few as 100 CFU of bacteria delivered into the lungs indicating TLR4 is essential for innate immunity to the bordetellosis (16). 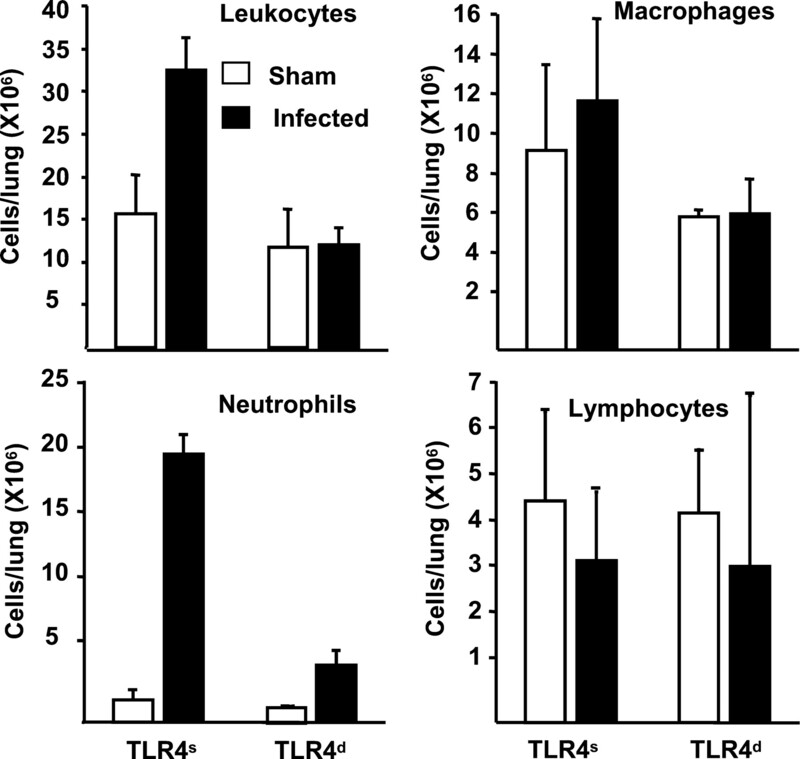 TLR4 is required for vaccine-induced but not for infection-induced immunity. A, Mice were either inoculated or vaccinated with B. bronchiseptica, and 28 days later challenged with 5 × 105 CFU of B. bronchiseptica. Trachea and lungs were harvested on day 3 postchallenge, and bacteria recovered from these organs were enumerated. B, Sera from vaccinated TLR4s and TLR4d mice were collected on day 28 postvaccination, and anti-Bordetella Ab titers were determined by ELISA. C, TLR4s mice were inoculated with 5 × 105 CFU of B. bronchiseptica and adoptively transferred 200 μl of serum from TLR4s or TLR4d mice 28 days after infection (IS) or vaccination (Vacc IS). The lungs and trachea were harvested on day 3 postinoculation, and bacteria recovered from these organs were enumerated. Results are the mean ± SE. The dashed line indicates the limit of detection. ∗, p ≤ 0.05. Because TLRs are also involved in generation of adaptive immunity (17), we sought to investigate the importance of TLR4 in adaptive immunity to respiratory pathogens. TLR4d mice were able to clear bacteria from the lower respiratory tract by day 28 postinoculation when inoculated with extremely low doses (100 CFU in 5 μl of PBS) deposited only in the nose (P. E. Mann and E. T. Harvill, unpublished observation), suggesting that TLR4 is not essential for the generation of Abs, which we have shown are sufficient to clear the trachea and lungs (10). To assess the anamnestic response to subsequent infection, TLR4s and TLR4d mice convalescent from this low dose inoculation were challenged with our standard dose of bacteria on day 28 postinoculation. Both wild-type convalescent and TLR4s convalescent mice cleared bacteria from the trachea and lungs by day 3 postchallenge (Fig. 1⇑A) indicating TLR4 is not essential for the generation of efficient infection-induced protective immunity. To investigate the requirement for TLR4 for vaccine-induced immunity, TLR4s and TLR4d mice were i.p. vaccinated with 108 heat-killed B. bronchiseptica and boosted with a second dose 14 days later. On day 28 postvaccination, mice were challenged with B. bronchiseptica by our standard regimen and the trachea and lungs were harvested 3 days later to assess bacterial numbers. TLR4s mice had cleared bacteria from these sites by this time. Interestingly, TLR4d mice harbored ∼10,000 CFU in the trachea and 10,000,000 CFU in the lungs (Fig. 1⇑A). Together, these data indicate that TLR4 is critical for vaccine-induced immunity but not for infection-induced immunity. Parenteral vaccines generate a high serum Ab response and we have shown that Abs are sufficient to rapidly clear B. bronchiseptica from the trachea and lungs of TLR4s mice (10). We hypothesized that the failure of vaccinated TLRd mice to control bacteria may be due to a defective Ab response. Serum was collected from vaccinated TLR4s and TLRd mice on day 28 postvaccination, and anti-Bordetella Ab titers were determined. No significant difference was observed between the sera from vaccinated TLR4s and TLRd mice in anti-Bordetella total Abs (Fig. 1⇑B) or in specific isotypes (IgM, IgG1, IgG2a, IgG2b, IgG3, and IgA) (data not shown). To determine whether the serum from vaccinated TLR4d mice is less effective than TLR4s wild-type serum in clearing bacteria, wild-type mice were inoculated with bacteria and adoptively transferred 200 μl of convalescent-phase serum or vaccine-induced serum from either TLR4s or TLR4d mice. Mice were sacrificed on day 3 postinoculation, and the number of bacteria recovered from the trachea and lungs was enumerated. 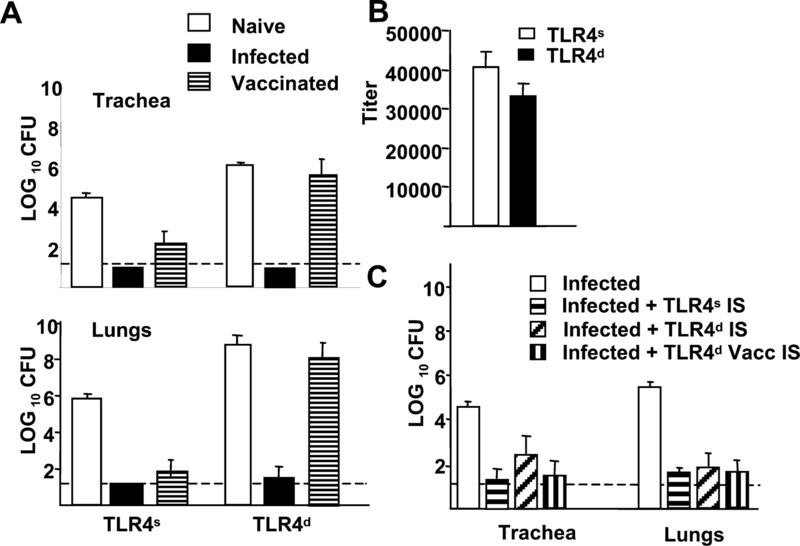 TLR4d vaccine serum, similar to TLR4s or TLR4d convalescent-phase serum, cleared the bacteria from both the trachea and lungs of wild-type mice, indicating that the failure of vaccinated TLR4d mice to clear B. bronchiseptica is not due to a defect in Ab generation (Fig. 1⇑C). To determine whether failure of vaccination to induce protection could be explained by a defect in Ab function in TLR4d mice, TLR4s and TLR4d mice were inoculated with B. bronchiseptica by our standard regimen and adoptively transferred 200 μl of naive or convalescent-phase serum at the time of inoculation. TLR4s mice treated with naive serum harbored ∼107 CFU of B. bronchiseptica in the lungs and 105 CFU in the trachea on day 3 postinoculation, indicating that naive serum has no significant effect on bacterial numbers (Fig. 2⇓A). In contrast, convalescent-phase serum reduced bacterial numbers by 99.9% to <100 bacteria in the trachea and lungs of these animals. TLR4d mice treated with naive serum harbored ∼100- to 1000-fold more bacteria than found in TLR4s mice lungs and trachea on day 3 postinoculation. 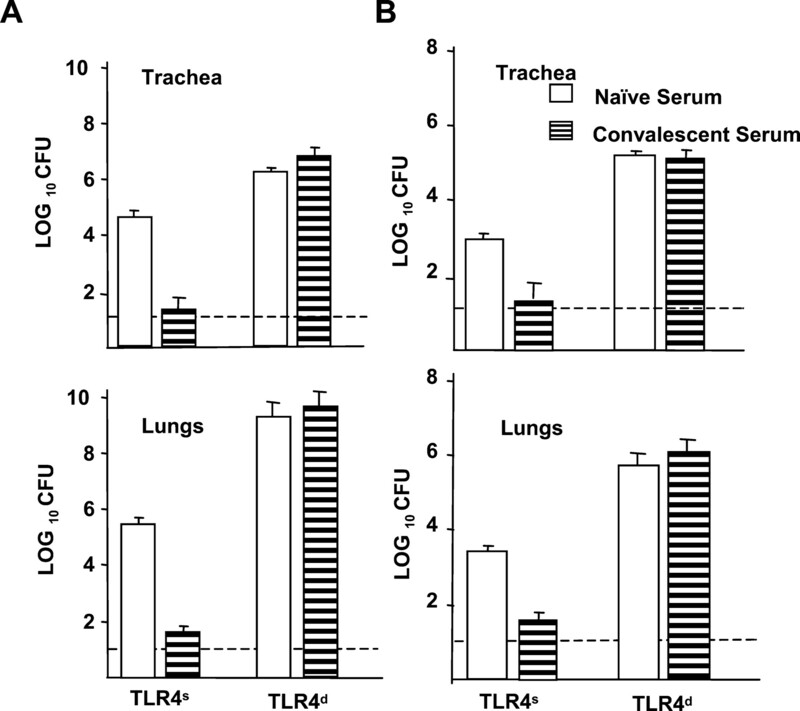 Surprisingly, convalescent-phase serum failed to reduce bacterial numbers in TLR4d mice, suggesting that TLR4 is required for Ab-mediated clearance of bacteria from the respiratory tract. TLR4 is required for function of Abs. A, TLR4s and TLR4d mice were inoculated with 5 × 105 CFU of B. bronchiseptica and adoptively transferred 200 μl of TLR4s convalescent-phase serum on day 0. The lungs and trachea were harvested on day 3 postinoculation, and bacteria recovered from these organs were enumerated. B, TLR4s and TLR4d mice were inoculated with 500 CFU of B. bronchiseptica and adoptively transferred 200 μl of TLR4s convalescent-phase serum on day 0. The lungs and trachea were harvested on day 3 postinoculation, and bacteria recovered from these organs were enumerated. Results are the mean ± SE. The dashed line indicates the limit of detection. ∗, p ≤ 0.05. Because the bacterial burdens in TLR4d mice are ∼1000-fold higher than in TLR4s mice on day 3 postinoculation, it is possible that the total amount of Abs transferred was not sufficient to eliminate the very high numbers of bacteria in TLR4d mice. To address this possibility we inoculated TLR4s and TLR4d mice with ∼500 CFU of B. bronchiseptica in 50 μl of PBS. With this inoculation regimen, 105–106 CFU of B. bronchiseptica were recovered from the lungs and 104–105 CFU from the trachea of TLR4d mice on day 3 postinoculation (Fig. 2⇑B). Serum Abs are effective in clearing similar bacterial burdens from the lower respiratory tract of wild-type mice (Fig. 2⇑A). However, transfer of serum had no measurable effect on bacterial numbers on day 3 postinoculation in TLR4d mice, indicating that TLR4 is required for the in vivo antimicrobial effects of Abs. TLR4d mice have previously been shown to be defective in inducing various proinflammatory cytokines in response to Gram-negative bacteria (25). One of the possible reasons for the inability of serum Abs to clear bacteria from TLR4d mice may be attenuated inflammatory cell recruitment as a result of a dysregulated chemokine response. To determine whether TLR4 is required for the recruitment of inflammatory cells to the site of infection we inoculated TLR4s and TLR4d mice with B. bronchiseptica or a PBS control. Mice were sacrificed 12 h postinoculation and lung leukocytes were enumerated. The total lung leukocytes in TLR4s mice were twice that of TLR4d mice (Fig. 3⇓). No significant difference in the number of macrophages or lymphocytes was observed; however, the early neutrophil response was greatly reduced in TLR4d mice. TLR4 is required for the early recruitment of neutrophils to the lungs. TLR4s and TLR4d mice were inoculated with 5 × 105 CFU of B. bronchiseptica, and lungs were collected after 12 h. Lungs were digested with collagenase type I and DNase I, and leukocytes were separated by density gradient and total leukocytes, and individual cell types were determined. Results are the mean ± SE. ∗, p ≤ 0.05. B. bronchiseptica infection results in rapid infiltration of PMN to the lungs (3). However, TLR4d mice show a defective early PMN response, raising the possibility that PMN are critical in Ab-mediated clearance of bacteria. To investigate the role of PMN, we used mAb RB6-8C5, which has been shown to deplete granulocytes without affecting circulating and resident macrophages (26). Groups of wild-type mice received i.p. injections with either PBS or 1 mg of RB6-8C5 mAb (neutrophil-depleted) (27). Subsequently, these mice were inoculated with B. bronchiseptica and adoptively transferred either naive or convalescent-phase serum as previously described. 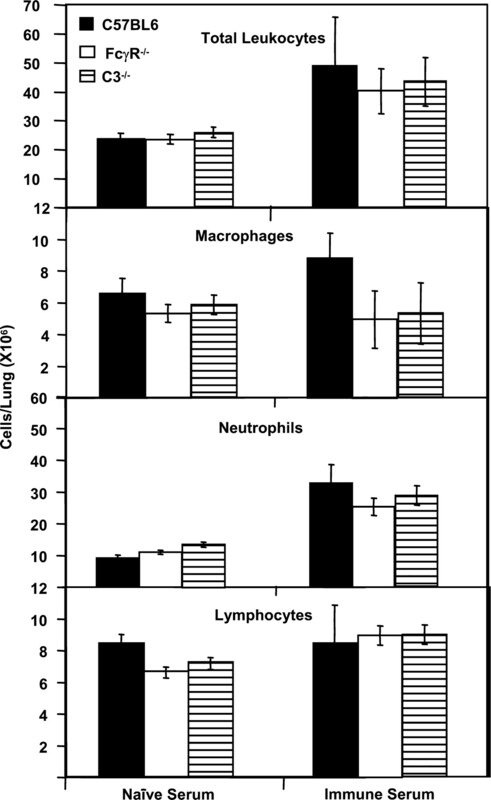 On day 3 postinoculation, neutrophildepleted mice given naive serum harbored ∼107 CFU in the lungs and 105 CFU in the trachea (Fig. 4⇓). As expected, mice treated with PBS and convalescent-phase serum cleared the bacteria from the trachea and lungs by day 3 postinoculation. In contrast, neutrophildepleted mice treated with convalescent-phase serum harbored 10,000-fold more CFU in the trachea and 1,000,000-fold higher CFU in the lungs than control mice treated with convalescent-phase serum. Neutrophil depletion did not significantly alter the recruitment of macrophages or lymphocytes into the lungs of infected mice (data not shown). To rule out the possibility that mAb-mediated depletion of neutrophils affected complement, we injected RB6-8C5 3 days before inoculation and observed the same failure to clear bacteria from the lower respiratory tract (data not shown). These data suggest that neutrophils are required for Ab-mediated clearance of bacteria. PMN are required for Ab-mediated clearance of B. bronchiseptica. Groups of mice received injections with 1 mg of RB6-8C5 mAbs or PBS. These mice received subsequent injections with 200 μl of either convalescent-phase or naive serum. All mice were inoculated with 5 × 105 CFU of B. bronchiseptica. The lungs and trachea were harvested on day 3 postinoculation, and bacteria recovered from these organs were enumerated. Results are the mean ± SE. The dashed line indicates the limit of detection. ∗, p ≤ 0.05. Neutrophils are known to clear extracellular bacteria by phagocytosis via various receptor-dependent mechanisms (28). Fc receptors present on neutrophils can specifically recognize Ab-bound bacteria and facilitate phagocytosis (28). The requirement for FcγRs in Ab-mediated bacterial clearance was investigated using mice, which lack all three FcγRs (FcγR−/−) (19). Groups of wild-type C57BL/6 and FcγR−/− mice were inoculated with B. bronchiseptica and with adoptively transferred naive or convalescent-phase serum as described previously. As before, convalescent-phase serum, but not naive serum, dramatically reduced bacterial numbers in the trachea and lungs of wild-type mice on day 1 and cleared the bacteria by day 3 postinoculation (Fig. 5⇓A). In contrast, convalescent serum did not reduce the number of bacteria recovered from the lungs of FcγR−/− mice (Fig. 5⇓A), indicating FcγRs are required for Ab-mediated bacterial clearance in the lungs. Interestingly, the number of bacteria recovered from the trachea of convalescent-phase serum treated FcγR−/− mice was significantly lower than that recovered from naive serum treated wild-type or FcγR−/− mice (Fig. 5⇓A). These data indicate that FcγRs are required for Ab-mediated clearance of bacteria from the lungs but not from the trachea. FcγRs are necessary for Ab-mediated clearance of B. bronchiseptica from the lungs. A, FcγR−/− mice were inoculated with 5 × 105 CFU of B. bronchiseptica and treated with either convalescent-phase (IS) or naive serum (NS) on day 0. The lungs and trachea were harvested on day 1 and 3 postinoculation, and bacteria recovered from these organs were enumerated. B, Mice were inoculated with 5 × 105 CFU of B. bronchiseptica and injected with 200 μl of either convalescent-phase or naive serum on day 0. Lungs were collected on day 3 postinoculation to assess the bacterial numbers. Results are the mean ± SE. The dashed line indicates the limit of detection. ∗, p ≤ 0.05. To further determine whether any individual FcγR is critical for the Ab-mediated clearance of bacteria, combinations of mouse strains that lack one or more FcγRs were used. These include FcγRII−/−, FcγRIII−/−, and common γ chain-deleted mice that lack FcγRI and FcγRIII (FcγRI−/− and FcγRIII−/−) (20, 21). These mice were inoculated with the standard dose of bacteria and adoptively transferred naive or convalescent-phase serum as previously described. Convalescent serum had little effect on bacterial numbers in mice lacking all three FcγRs, but rapidly cleared bacteria from the lungs of mice lacking one or two FcγRs (Fig. 5⇑B). These data indicate that no specific FcγR is required and suggest that the presence of any single FcγR is sufficient for Ab-mediated bacterial clearance in the lungs. The inability of FcγR−/− mice to rapidly eliminate bacteria upon adoptive transfer of Abs could be due to either the absence of FcγR bearing cells at the site of infection or the failure of these cells to phagocytose opsonized bacteria. To differentiate between these two possibilities, we analyzed the inflammatory cell recruitment (neutrophils, macrophages, and lymphocytes) in the lungs of FcγR−/− mice in response to bacterial infection. There was no significant difference between the total number of inflammatory cells or individual cell populations recovered from the lungs of wild-type and FcγR−/− mice (Fig. 6⇓), suggesting no impairment of cellular recruitment in FcγR−/− mice. Furthermore, histopathology of lungs from wild-type and FcγR−/− mice infected with B. bronchiseptica did not reveal a significant difference in inflammation (data not shown). These results suggest that the failure of FcγR−/− mice to clear bacteria upon adoptive transfer of Abs is not due to a defect in recruitment of phagocytic cells but may be due to the impaired phagocytosis of opsonized bacteria. C3−/− and FcγR−/− mice show normal leukocyte recruitment to the lungs in response to B. bronchiseptica. Wild-type, C3−/−, and FcγR−/− mice were inoculated with B. bronchiseptica, and lungs were collected after 12 h. Lungs were digested with collagenase I and DNase I, and leukocytes were separated by density gradient and total leukocytes, and individual cell types were determined. Results are the mean ± SE. ∗, p ≤ 0.05. Complement can augment the effect of Ab-mediated bacterial clearance in vivo by enhancing phagocytosis via FcγRs or by direct bacterial lysis (29). Abs bound to bacteria can activate complement resulting in downstream effects such as lysis via MAC release of chemoattractants C3a and C5a, and iC3b-mediated opsonization (5, 30, 31). Because the combination of Ab and complement-mediated opsonization can synergistically increase phagocytosis, we evaluated the role of complement using mice that lack C3, the central complement component required for both classical and alternate activation pathways. Groups of wild-type (C57BL/6) and C3−/− mice were inoculated and adoptively transferred either naive or convalescent-phase serum as previously described. Recovery of bacteria from these mice was analyzed on days 1 and 3 postinoculation in the respiratory organs. Wild-type mice treated with convalescent-phase serum rapidly reduced bacterial numbers in the trachea and lungs by day 1 and completely cleared the bacteria by day 3 postinoculation (Fig. 7⇓A). However, C3−/− mice failed to reduce bacterial numbers from the trachea and lungs on days 1 and 3 postinoculation and harbored 1000- to 100,000-fold higher CFU than wild-type mice (Fig. 7⇓A). These results indicate that C3 is necessary for the Ab-mediated clearance of bacteria. These data along with data from FcγR−/− mice suggest that Ab-mediated neutralization of bacterial adhesins or toxins is not sufficient to clear the bacteria from the lower respiratory tract. Complement component C3 and CR3 are necessary for Ab-mediated clearance of B. bronchiseptica. A, Wild-type and C3−/− mice were inoculated with 5 × 105 CFU of B. bronchiseptica and treated with 200 μl of either convalescent-phase or naive serum on day 0. The lungs and trachea were harvested on days 1 and 3 postinoculation, and bacteria recovered from these organs were enumerated. B, Wild-type and C3−/− mice were inoculated with 5 × 105 CFU of B. bronchiseptica and treated with 200 μl of either convalescent-phase or naive serum on day 0. The lungs and trachea were harvested on day 3 postinoculation, and bacteria recovered from these organs were enumerated. C, Wild-type and CR3−/− mice were inoculated with 5 × 105 CFU of B. bronchiseptica and treated with 200 μl of either convalescent-phase or naive serum on day 0. The lungs and trachea were harvested on day 3 postinoculation, and bacteria recovered from these organs were enumerated. Results are the mean ± SE. The dashed line indicates the limit of detection. ∗, p ≤ 0.05. To investigate whether Ab-mediated bacterial clearance in vivo is via MAC-mediated lysis we used mice that lack C5, which is essential for MAC formation and C5a release (29). Groups of wild-type and isogenic C5−/− mice were inoculated and adoptively transferred 200 μl of naive or convalescent-phase serum as previously described. 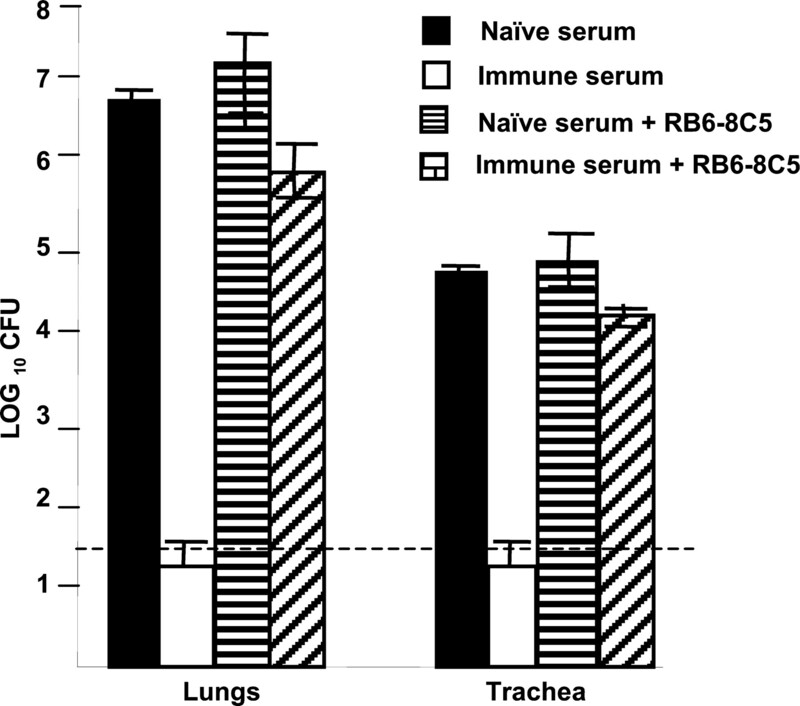 Both wild-type and C5−/− mice treated with convalescent, but not naive serum, cleared bacteria from the trachea and lungs (Fig. 7⇑B), indicating that C5-dependent mechanisms such as MAC formation and C5a release are not necessary for complement-dependent Ab-mediated bacterial clearance. Because C3 is required for the release of the chemoattractant C3a, we investigated whether C3 is required for inflammatory cell recruitment by enumerating the lung leukocytes recovered from wild-type and C3−/− mice. Wild-type and C3−/− mice were inoculated with bacteria, and the number of neutrophils, macrophages, and lymphocytes were enumerated in the lungs 12 h postinoculation. No significant differences in the total number of cells or individual cell populations were noted between wild-type and C3−/− mice (Fig. 6⇑). Total neutrophil counts were slightly increased both in wild-type and C3−/− mice after they were treated with convalescent-phase serum (Fig. 6⇑). Furthermore, histological evaluation of lungs from wild-type and C3−/− mice inoculated with bacteria showed similar levels of cellular infiltrates and inflammation (data not shown). Thus, no significant impairment in the inflammatory cell recruitment was observed in the absence of C3a and C5a in response to bacteria or transfer of serum Abs. Because complement appears to be required for functions other than direct lysis or cellular recruitment, we hypothesized that it may mediate complement-dependent opsonization via CR3 present on phagocytes such as neutrophils. To investigate the importance of CR3, wild-type (C57BL/6) and CD11b−/− (CR3−/−) mice were inoculated with B. bronchiseptica and adoptively transferred 200 μl of either naive serum or convalescent-phase serum. CR3−/− mice treated with naive serum harbored similar numbers of bacteria in the various respiratory organs on day 3 postinoculation as that of wild-type mice (Fig. 7⇑C). However, CR3−/− mice treated with convalescent-phase serum harbored bacterial numbers that were ∼100-fold higher in the trachea and 10,000-fold higher in the lungs when compared with similarly treated wild-type mice (Fig. 7⇑C). These data indicate that CR3 contributes to efficient Ab-mediated bacterial clearance. Together, these data suggest that complement is required for opsonization and phagocytosis but not for C3a- and C5a-dependent chemotaxis or for direct lysis of bacteria. Elucidation of the immune mechanisms that eliminate pathogens from the body is essential for the design of therapeutic and prophylactic measures against various infectious diseases. Although a large body of literature is available on the role of cell-mediated and humoral immune responses and their specific mechanisms in eliminating bacteria from systemic organs such as liver, kidneys, etc, that of respiratory organs is less well studied. Abs are believed to play a major role in immunity to respiratory pathogens such as S. pneumoniae, H. influenzae, and P. aeruginosa (32, 33, 34). However, the mechanisms behind Ab-mediated clearance of these extracellular pathogens are not completely understood. Much of the current understanding of how Abs may facilitate clearance of S. pneumoniae and P. aeruginosa come from in vitro studies using mAbs (16, 35). However, the in vivo mechanisms of Ab-mediated bacterial clearance are likely to be more complicated than the findings of in vitro studies imply. In this study, we describe the complex mechanisms required for the Ab-mediated clearance of the natural mouse respiratory pathogen B. bronchiseptica. Previously, we have shown that adoptive transfer of convalescent-phase serum rapidly clears B. bronchiseptica from the lungs and tracheas of mice (10). Using this approach, we found that TLR4 is critical in the Ab-mediated clearance of B. bronchiseptica. Although TLR4 has been shown to play an important role in the generation of an effective adaptive immune response (17), our data show that TLR4 is also critical in the function of Abs in clearing a bacterium. It is interesting that convalescent but not vaccinated TLR4d mice were able to mount an effective immune response against subsequent bacterial challenge. Recently, we have determined that the mechanism of infection-induced immunity differs from vaccine-induced immunity (L. Gopinathan and E. T. Harvill, unpublished observation). Our preliminary results suggest that infection-induced immunity induces a potent mucosal immune response in addition to local Th1 response, whereas vaccination induces primarily serum Abs and little local T cell response (L. Gopinathan and E. T. Harvill, unpublished observation), which could potentially explain the differential requirement for TLR4. We also observed that TLR4 is required for the early recruitment of PMN to the lungs and those PMN are necessary for Ab-mediated clearance of bacteria. Complement is essential for Ab-mediated clearance of B. bronchiseptica, although the role of MAC-mediated lysis, and C3a- and C5a-mediated cellular recruitment appears to be limited. These findings were surprising because the MAC kills this bacterium in vitro (33) and C5a is an extremely potent chemoattractant (5, 31). We have not ruled out the possibility that C3a plays an important role in the activation of the recruited cells. However, our observation that CR3−/− mice are unable to clear B. bronchiseptica from the lower respiratory tract even upon transfer of convalescent-phase serum suggests that C3 is required for iC3b-mediated opsonization which facilitates Ab-mediated phagocytosis and clearance of B. bronchiseptica. FcγRs were also found to be essential for bacterial clearance from the lungs, although the presence of any single FcγR appears to be sufficient to clear opsonized bacteria. These results are consistent with previous reports describing synergy between FcγRs and CR3 in phagocytosis and cell activation (29). Together, these data suggest a model for how Abs mediate the clearance of B. bronchiseptica from the lower respiratory tract of mice: B. bronchiseptica induced inflammation via TLR4 is critical in the initial cellular recruitment of FcγR- and CR3-bearing PMN that phagocytose Ab- and iC3b-coated bacteria. Further analysis of the interaction of innate immune receptors, complement, and FcγRs in bacterial clearance is in progress. It is widely accepted that there are significant differences in the immune responses generated in the upper and lower respiratory tracts (36). This is reflected by the fact that the upper respiratory tract is more permissive of bacterial colonization than the lower respiratory tract (37). In our model, serum Abs have no effect on the bacterial numbers in the nasal cavity but can rapidly clear B. bronchiseptica from the trachea and lungs (10). Our data further suggest that there are significant differences in the mechanism of Ab-dependent bacterial clearance within the various regions of the lower respiratory tract. FcγRs are not required for the Ab-mediated clearance of B. bronchiseptica from the trachea but are essential in the lungs. C3, but not C5, is required in both organs. This finding suggests that the serum Ab-initiated complement activation and iC3b deposition are sufficient for efficient phagocytosis in the trachea. The additional requirement for FcγRs in the lungs may reflect the different physiology of this organ. In the absence of the powerful mucociliary escalator function of the trachea, the immune response in the lungs may be dependent upon the more efficient phagocytosis and/or killing of opsonized bacteria via both FcγRs and CR3. It is also possible that this interesting organ-specific requirement for Ab effector function may reflect the different risks and benefits of immune activation in different regions of the respiratory tract. The current vaccines to many bacterial pathogens are either inactivated or subunit vaccines that generate potent serum Ab responses and are effective in preventing disease symptoms upon infection. However, they often fail to provide sterilizing immunity or prevent subclinical infections, allowing these bacteria to transiently infect immune individuals and circulate in a population (38, 39, 40), which presents an ongoing health risk to unvaccinated, immunocompromised, very young, and elderly populations. Because the objective of an ideal vaccine is not only to prevent disease but also to prevent spread of the pathogen, understanding the molecular mechanisms of bacterial clearance will provide a rationale to modifying the existing vaccination strategies to improve long lasting protection from infection. Our current studies delineate the mechanisms involved in Ab-mediated bacterial clearance of the prototypical respiratory pathogen B. bronchiseptica. Because both FcγRs and complement are required in the lungs, vaccines may be more effective if they induce isotypes of Abs that efficiently activate complement as well as those that bind FcγRs. The contributions of different Ab effector functions, as well as the stimulation of PRRs, may be necessary for efficient elimination of bacterial respiratory pathogens. The absolute requirement for multiple components also raises the possibility that pathogens could avoid clearance by inhibiting any one of a complex interactive system of immune functions. We thank Kelly Elder and other members of the Harvill laboratory for technical assistance and critical reading of the manuscript. ↵1 This work was supported by National Institutes of Health Grant AI053075 (to E.T.H.). P.B.M. was supported by the U.S. Army Medical Service Corps Long-Term Health Education and Training Program. ↵3 Abbreviations used in this paper: MAC, membrane attack complex; PRR, pattern recognition receptor; PMN, polymorphonuclear cell. Winslow, G. M., E. Yager, J. S. Li. 2003. Mechanisms of humoral immunity during Ehrlichia chaffeensis infection. Ann. NY Acad. Sci. 990: 435-443. Casadevall, A.. 2002. Passive antibody administration (immediate immunity) as a specific defense against biological weapons. Emerg. Infect. Dis. 8: 833-841. Harvill, E. T., P. A. Cotter, J. F. Miller. 1999. Pregenomic comparative analysis between Bordetella bronchiseptica RB50 and Bordetella pertussis Tohama I in murine models of respiratory tract infection. Infect. Immun. 67: 6109-6118. Briles, D. E., J. L. Clafin, K. Schroer, C. Forman. 1981. Mouse IgG3 antibodies are highly protective against infection with Streptococcus pneumoniae. Nature 294: 88-90. Walport, M. J.. 2001. Complement: second of two parts. N. Engl. J. Med. 344: 1140-1144. McLay, J., E. Leonard, S. Petersen, D. Shapiro, N. S. Greenspan, J. R. Schreiber. 2002. γ3 gene-disrupted mice selectively deficient in the dominant IgG subclass made to bacterial polysaccharides. II. Increased susceptibility to fatal pneumococcal sepsis due to absence of anti-polysaccharide IgG3 is corrected by induction of anti-polysaccharide IgG1. J. Immunol. 168: 3437-3443. Sawada, S., M. Suzuki, T. Kawamura, S. Fujinaga, Y. Masuho, K. Tomibe. 1984. Protection against infection with Pseudomonas aeruginosa by passive transfer of monoclonal antibodies to lipopolysaccharides and outer membrane proteins. J. Infect. Dis. 150: 570-576. Parkhill, J., M. Sebaihia, A. Preston, L. D. Murphy, N. Thomson, D. E. Harris, M. T. Holden, C. M. Churcher, S. D. Bentley, K. L. Mungall, et al 2003. Comparative analysis of the genome sequences of Bordetella pertussis, Bordetella parapertussis and Bordetella bronchiseptica. Nat. Genet. 35: 32-40. Kirimanjeswara, G. S., P. B. Mann, E. T. Harvill. 2003. Role of antibodies in immunity to Bordetella infections. Infect. Immun. 71: 1719-1724. Chapes, S. K., D. A. Mosier, A. D. Wright, M. L. Hart. 2001. MHCII, TLR4 and NRAMP1 genes control host pulmonary resistance against the opportunistic bacterium Pasteurella pneumotropica. J. Leukocyte Biol. 69: 381-386. Wang, X., C. Moser, J. P. Louboutin, E. S. Lysenko, D. J. Weiner, J. N. Weiser, J. M. Wilson. 2002. Toll-like receptor 4 mediates innate immune responses to Haemophilus influenzae infection in mouse lung. J. Immunol. 168: 810-815. Mann, P. B., M. J. Kennett, E. T. Harvill. 2004. Toll-like receptor 4 is critical to innate host defense in a murine model of bordetellosis. J. Infect. Dis. 189: 833-836. Medzhitov, R., P. Preston-Hurlburt, C. A. Janeway, Jr. 1997. A human homologue of the Drosophila Toll protein signals activation of adaptive immunity. Nature 388: 394-397. Circolo, A., G. Garnier, W. Fukuda, X. Wang, T. Hidvegi, A. J. Szalai, D. E. Briles, J. E. Volanakis, R. A. Wetsel, H. R. Colten. 1999. Genetic disruption of the murine complement C3 promoter region generates deficient mice with extrahepatic expression of C3 mRNA. Immunopharmacology 42: 135-149. Ravetch, J. V.. 1997. Fc receptors. Curr. Opin. Immunol. 9: 121-125. Takai, T., M. Li, D. Sylvestre, R. Clynes, J. V. Ravetch. 1994. FcR γ chain deletion results in pleiotrophic effector cell defects. Cell 76: 519-529. Takai, T., M. Ono, M. Hikida, H. Ohmori, J. V. Ravetch. 1996. Augmented humoral and anaphylactic responses in FcγRII-deficient mice. Nature 379: 346-349. Mann, P. B., K. D. Elder, M. J. Kennett, E. T. Harvill. 2004. Toll-like receptor 4-dependent early elicited tumor necrosis factor α expression is critical for innate host defense against Bordetella bronchiseptica. Infect. Immun. 72: 6650-6658. Simecka, J. W., P. Patel, J. K. Davis, S. E. Ross, P. Otwell, G. H. Cassell. 1991. Specific and nonspecific antibody responses in different segments of the respiratory tract in rats infected with Mycoplasma pulmonis. Infect. Immun. 59: 3715-3721. Netea, M. G., C. van der Graaf, J. W. Van der Meer, B. J. Kullberg. 2004. Toll-like receptors and the host defense against microbial pathogens: bringing specificity to the innate-immune system. J. Leukocyte Biol. 75: 749-755. Beutler, B., K. Hoebe, X. Du, R. J. Ulevitch. 2003. How we detect microbes and respond to them: the Toll-like receptors and their transducers. J. Leukocyte Biol. 74: 479-485. Conlan, J. W.. 1997. Critical roles of neutrophils in host defense against experimental systemic infections of mice by Listeria monocytogenes, Salmonella typhimurium, and Yersinia enterocolitica. Infect. Immun. 65: 630-635. Seiler, P., P. Aichele, B. Raupach, B. Odermatt, U. Steinhoff, S. H. Kaufmann. 2000. Rapid neutrophil response controls fast-replicating intracellular bacteria but not slow-replicating Mycobacterium tuberculosis. J. Infect. Dis. 181: 671-680. Fjaertoft, G., L. Håkansson, U. Ewald, T. Foucard, P. Venge. 1999. Neutrophils from term and preterm newborn infants express the high affinity Fcγreceptor I (CD64) during bacterial infections. Pediatr. Res. 45: 871-876. Jones, S. L., U. G. Knaus, G. M. Bokoch, E. J. Brown. 1998. Two signaling mechanisms for activation of αMβ2 avidity in polymorphonuclear neutrophils. J. Biol. Chem. 273: 10556-10566. Corbi, A. L., T. K. Kishimoto, L. J. Miller, T. A. Springer. 1988. The human leukocyte adhesion glycoprotein Mac-1 (complement receptor type 3, CD11b) α subunit: cloning, primary structure, and relation to the integrins, von Willebrand factor and factor B. J. Biol. Chem. 263: 12403-12411. Englund, J. A., W. P. Glezen. 2000. Passive immunization for the prevention of otitis media. Vaccine 19: S116-S121. Felts, A. G., G. Giridhar, D. W. Grainger, J. B. Slunt. 1999. Efficacy of locally delivered polyclonal immunoglobulin against Pseudomonas aeruginosa infection in a murine burn wound model. Burns 25: 415-423. Norrby-Teglund, A., N. Ihendyane, J. Darenberg. 2003. Intravenous immunoglobulin adjunctive therapy in sepsis, with special emphasis on severe invasive group A streptococcal infections. Scand. J. Infect. Dis. 35: 683-689. Hou, L., H. Sasakj, P. Stashenko. 2000. B-cell deficiency predisposes mice to disseminating anaerobic infections: protection by passive antibody transfer. Infect. Immun. 68: 5645-5651. Woolard, M. D., L. M. Hodge, H. P. Jones, T. R. Schoeb, J. W. Simecka. 2004. The upper and lower respiratory tracts differ in their requirement of IFN-γ and IL-4 in controlling respiratory mycoplasma infection and disease. J. Immunol. 172: 6875-6883. Zhang, P., W. R. Summer, G. J. Bagby, S. Nelson. 2000. Innate immunity and pulmonary host defense. Immunol. Rev. 173: 39-51. Finn, A.. 2004. Bacterial polysaccharide-protein conjugate vaccines. Br. Med. Bull. 70: 1-14. Franco, E., C. Giambi, R. Ialacci, M. Maurici. 2004. Pertussis vaccination for adolescents and adults. Expert Opin. Biol. Ther. 4: 1669-1676.